Preheat oven to 350ºF. Lightly spray an 8-inch square pan with cooking spray and set aside. In a skillet, cook Italian sausage or ground beef until no longer pink. Drain fat. Remove from heat and stir in marinara sauce. Set aside. Combine cottage cheese, egg and parsley. Set aside. Pour 1/2 cup sauce into bottom of prepared pan. Top sauce with half of polenta slices. Top polenta with half of cottage cheese mixture. Sprinkle 1/3 of the mozzarella cheese on top of cottage cheese mixture. Spread half of sauce on top of mozzarella cheese. Repeat layers. 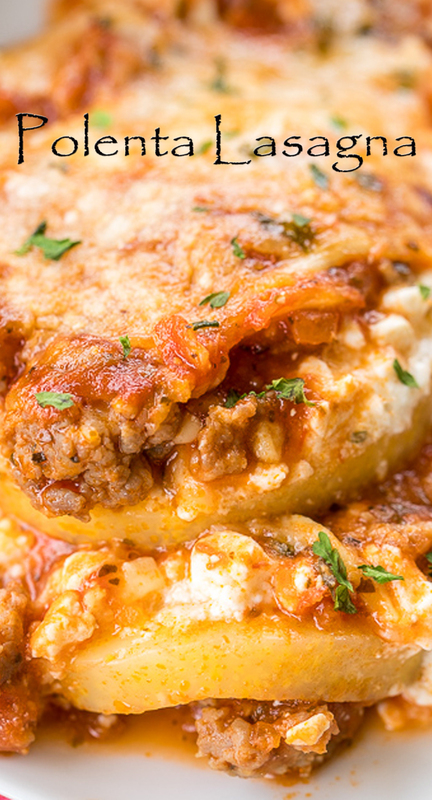 Top casserole with remaining mozzarella and parmesan cheese. Cover and bake for 30 minutes. Bake uncovered for an additional 15 minutes. Let stand 10 minutes before serving.